I'm curious why we jumped a whole month forward (via a subtle transition), but it looks as if the time since the events of "Things We Said Today" have allowed for some major announcements and attempts at moving forward for Grey's Anatomy. And "The End is the Beginning is the End" served as a quiet set up for some loud and dramatic things to come. Richard was more recently hit the hardest with Adele's passing, but it was nice to see that even through his own self-appointed misgivings, he was able to meet with Catherine. Simply holding hands was a nice sentiment for them both, and while Richard will always love Adele, at least he will have a chance to heal and grow again. 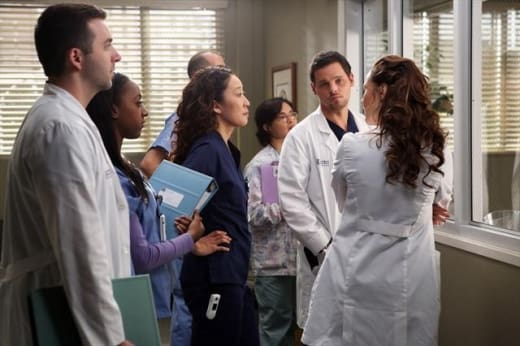 Cristina and Owen are in this weird place of dating/not dating - hooking up, as those college kids call it - but all under the new pretense of divorce. I like Cristina in her happy state, making jokes and being her regular self. Even her ability to not get upset that Meredith hadn't told her about the pregnancy showed an understanding in their friendship. And although I felt more comfortable with Jo and Alex being playful this episode, I don't buy them remaining friends. It's too obvious that soon enough that couch is going to get some action from the two not-lovers. Am I on board with the relationship? Not so much before, and I'm even holding out that Dr. Lucy might return, but I wasn't rolling my eyes with their playful banter this go around. Really, it was nice that things were working out for both of them. Even Jackson, who's moving forward in his relationship with the intern, also seems to be moving forward as a doctor. Taking a case that was formally Mark's was a huge step not only in remembering the past and the important things he'd done, but the new positive steps that would be taken in his wake. 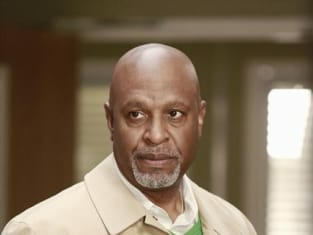 Sure, he had some arguments with Arizona, but Jackson proved himself by completing the more risky procedure. He's been able to start taking those steps from Mark's protege to his own competent and successful physician. Likewise, Derek is back on that road to recovery, playing in a great ping pong match. It was rather entertaining that the game became competitive and it was fun seeing Shane break out of his usual calm demeanor. Who knew ping pong could be such good therapy for Derek's hand? First came the generous settlement of $15 million each, and all I could think was "wow, what a payout." And good for them. Yes, Meredith mentioned blood money, but the cash could be used for good and Richard was right there to remind her. Sure enough, the dinner was awkward, and certainly not a celebration, but eventually all of the group came around and began to enjoy the prospects of the outcome. Meredith even revealed her big secret, which is promising in that she believes good things will happen. That was a nice change for her. Except the entire episode I couldn't help but wonder the repercussions and why no one seemed to acknowledge them. Even if the insurance company would be handling the financial aspects, the hospital itself would have to have some sort of reprimand, right? You don't just have a major court case and nothing happen but handing out some money. I'm still a little surprised no one seemed to really think about that. Yet, the episode itself seemed to offer up the dramatic twist that answered the unfortunate consequence of the win. According to some loophole, the hospital now has to pay out the $15 million each and there's no way it can do that. It looks like bankruptcy and closing the doors will be the only option. Man, and right after Derek had finally forgiven Owen! I find it hard to believe that Seattle Grace would be shut down, but I'm trying to guess what will take place to prevent it? Will they use the money to buy it out? Will someone else? A major conflict of interest was bound to rear its ugly head and, like Cristina said, "Mo money, mo problems." This wasn't the most riveting of episodes, but I'm glad to see a transition and chance for the characters to move forward from the dramatic plane crash. Although, now this new predicament might make things a little harder. Hopefully, this major bump in the road can find a quick way to smooth itself out with all of the positive changes going on around it.